While the highlight of today’s WINNING ICONS – Legendary Watches of the 20th Century auction by Phillips is undoubtedly Paul Newman’s Paul Newman Daytona ref. 6239, the sale will also include other incredible lots not to be overlooked. Living up to the name of the event, Phillips set out to curate a collection of 50 watches that are so recognizable that they merit the term “icon.” Think Nautilus, Monaco, Speedmaster, Tank and so many others. This is the who’s who of the watch world during the 20th century (and beyond). Here are some of the highlights. 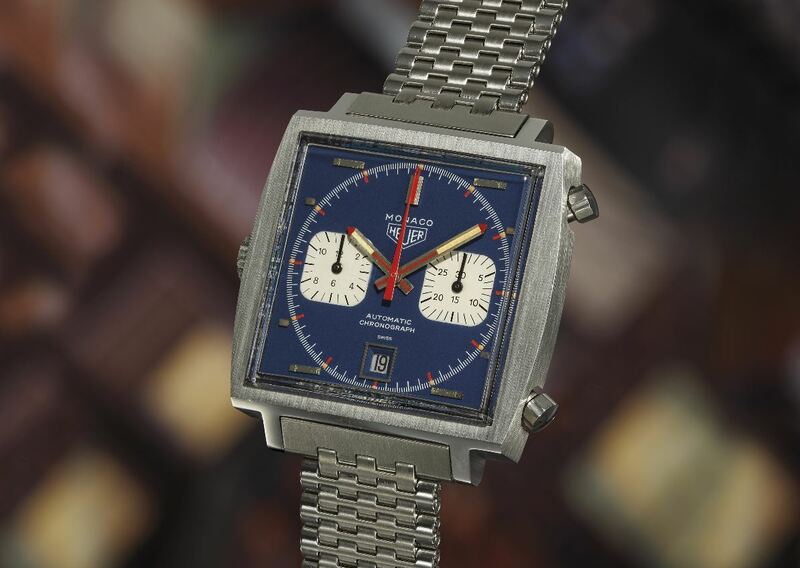 Kicking off the sale is the classic Heuer Monaco chronograph, designed by Jack Heuer himself and made famous by Steve McQueen in the movie Le Mans. Characterized by its large square case, blue dial, and white subdials, the Monaco was one of the world’s first chronographs. Estimated to sell within a range of $10,000 to $20,000, this particular example is ‘New Old Stock’ in unworn condition. The inspiration for the contemporary Omega Speedmaster “Speedy Tuesday” is the Alaska III Speedmaster — 56 NASA-commissioned watches from 1978. Due to the U.S. government’s “Buy American Act,” Omega had to have the cases of these watches made in America. Furthermore, the watches were developed using integral feedback by a NASA astronaut, including the large radially-oriented numbers on the subdials, as well as the lack of polished surfaces to avoid too much glare from the sun. Those initial 56 watches are property of the US government, however this particular example is part of a later batch, thus free to be owned by the public. 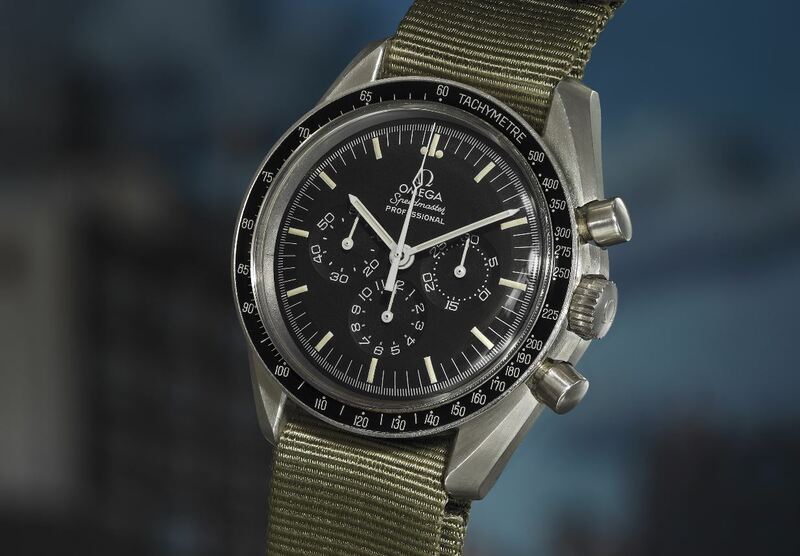 Boasting the NASA script SED12100312-30, the pre-estimate on this Omega Speedmaster is $50,000 – $100,000. 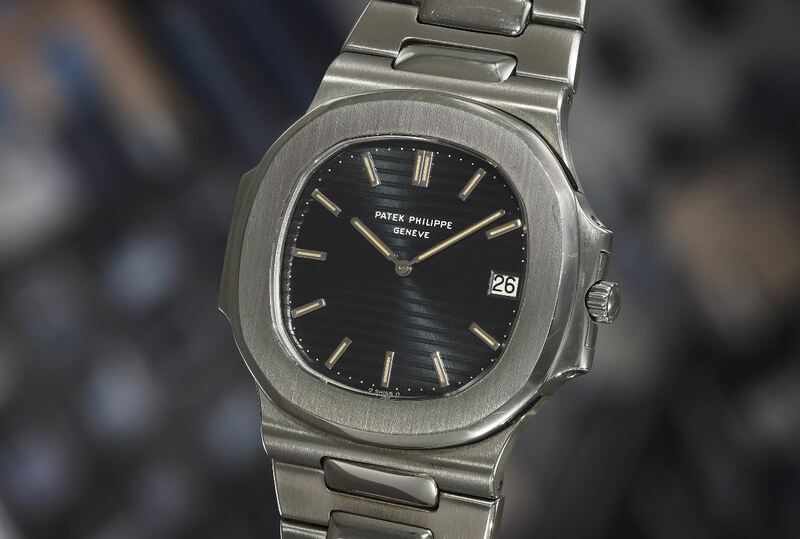 Famously designed by Gerald Genta, named after Captain Nemo’s Nautilus submarine from Jules Verne’s Twenty Thousand Leagues Under the Sea, fashioned in steel, and completely different to anything in Patek’s catalog at that time, the Nautilus’ epic journey began with the ref. 3700/001 in 1976. Today, the Patek Nautilus is one of the most coveted luxury sports watches available. This particular example of the Nautilus ref. 3700/001 dates back to 1977 and comes complete with all the fixings including the cork presentation box and original paperwork. 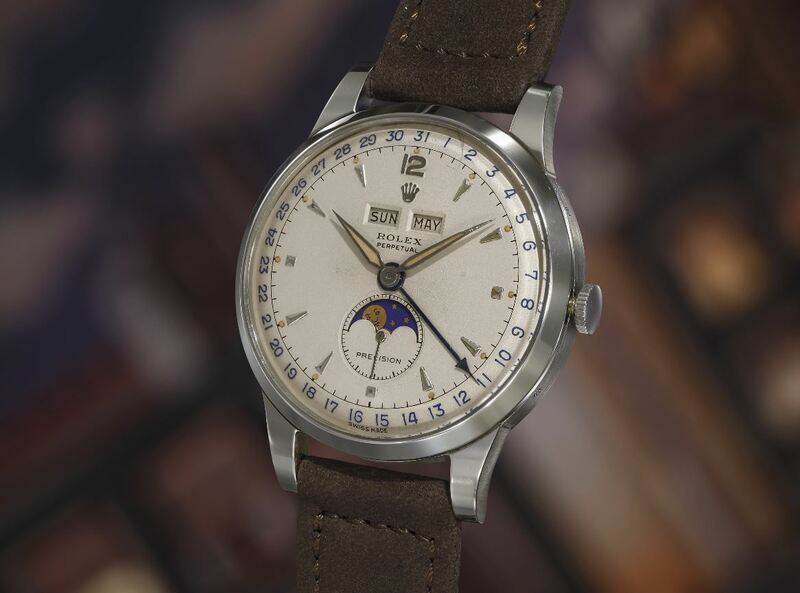 The price to own an early example of a Patek icon? Pre-sale estimate ranges from $30,000 to $60,000. A longer and larger version of the signature Tank, the Cartier Grand Tank Cintrée was introduced in 1921. 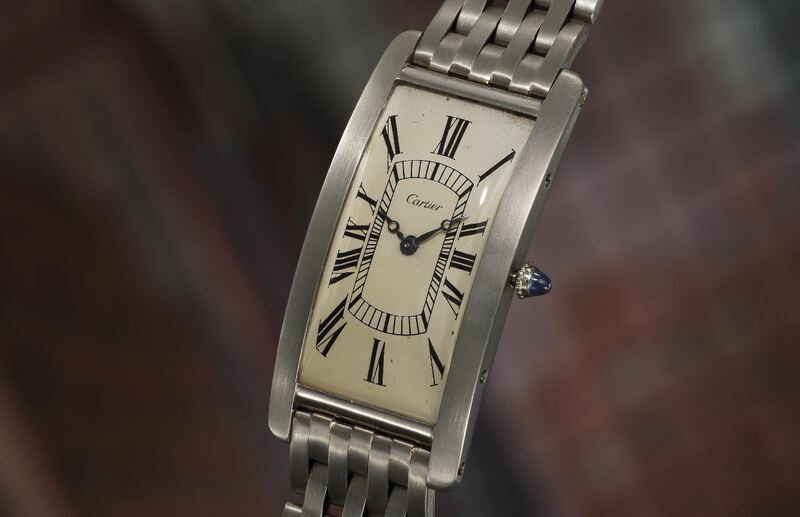 A design reflective of the Roaring Twenties era, its slim and arching case wraps exquisitely around the wrist. While Cartier has produced countless versions of the Tank watch over its 100-year history, this is perhaps one of the most beautiful. This particular example in platinum was owned by New York financier Oscar C. Seebass and is estimated to sell for $250,000 – $500,000. 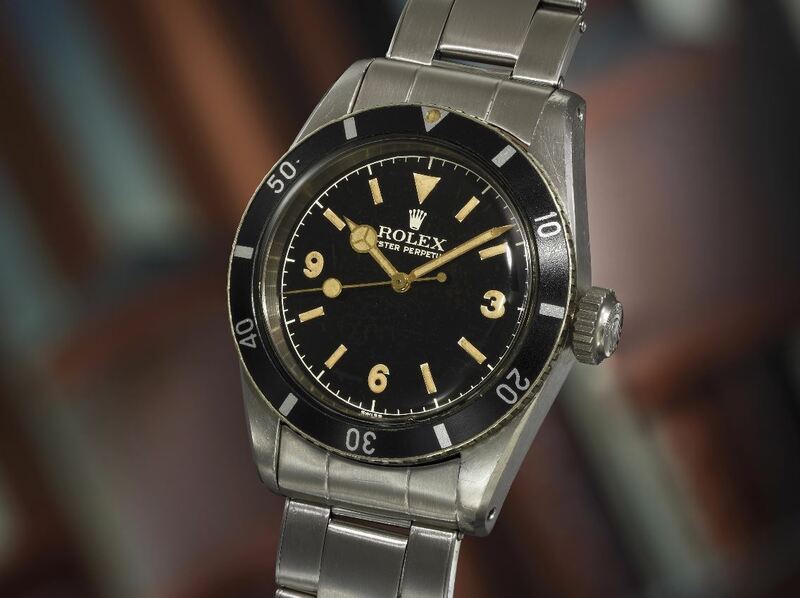 Affectionately known as the “Padellone,” which is Italian for frying pan, the Rolex ref. 8171 from the late 1940s and early 1950s is a triple calendar wristwatch that gets its nickname from its large (for the era) 38mm case. Perfectly proportional, the dial of the Rolex ref. 8171 boasts the day of the week, month, date, and moon phase indicators—one of only two Rolex models ever manufactured to include all these functions. This example of a 1950 Rolex Padellone in stainless steel comes with a pre-sale estimate of $400,000 – $800,000. Often referred to as the “King Submariner” by Rolex enthusiasts, this Submariner ref. 6200 with the big crown and water resistance of 200m is the inaugural model of the famous diving watch collection. So early in fact, that it does not even include the Submariner name yet on the dial. Rather, on the dial you’ll see the 3/6/9/ numeral layout (which was of course later replaced) as well as the first Mercedes-style hands ever used by the company. It’s estimated that the “Big Crown” Sub will sell anywhere between $250,000 to $500,000. In addition to the Rolex ref. 8171, the ref. 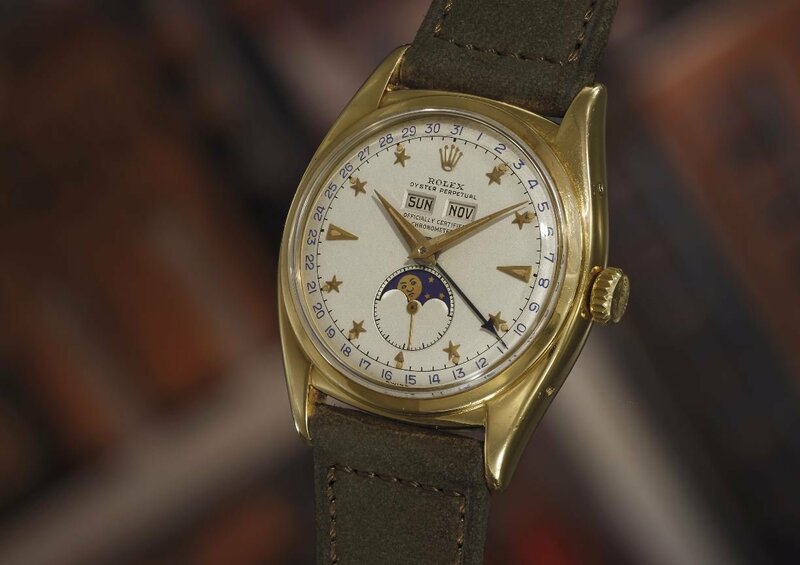 6062 was the only other Rolex watch to feature a triple calendar and moon phase. This time, rather than frying pan, this particular ref. 6062 is nicknamed “Stelline”— Italian for little star — alluding to the faceted stars serving as hour markers on the dial. With a 36mm case fashioned in 18k yellow gold and an accompanying yellow gold Jubilee bracelet manufactured by Gay Frères, this Rolex Stelline from 1953 is estimated to sell between $250,000 – $500,000. The Rolex Dato Compax made its debut in 1947 as the brand’s first triple calendar chronograph housed within an Oyster case. There were several references over the ensuing years, culminating in Rolex Oyster Chronograph Ref. 6236. While the dial incorporates plenty of information thanks to its blue outer date ring, day and month apertures, trio of registers, faceted indexes, and center hands, it remained balanced and legible. Nicknamed the “Jean-Claude Killy” after the champion skier, this particular stainless steel version from 1958 is set to cost the new owner anywhere between $200,000 – $400,000 to own. 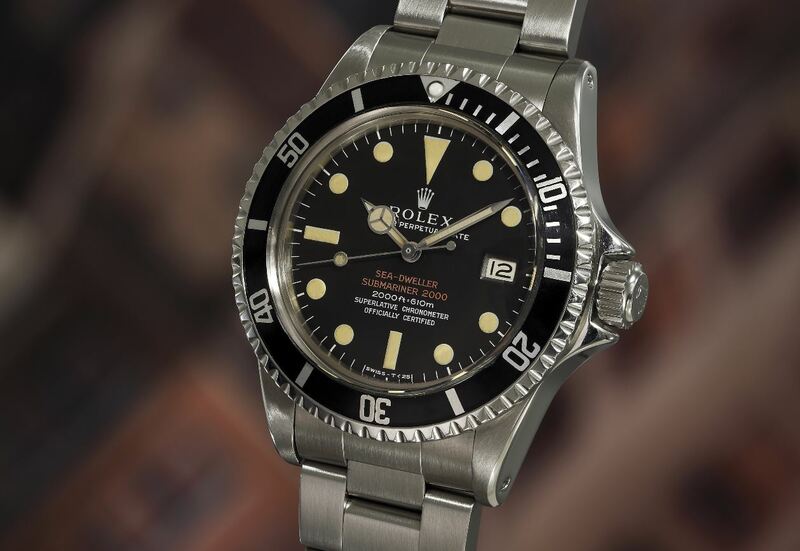 Fans of gem-set Rolex watches may recognize this GMT-Master ref. 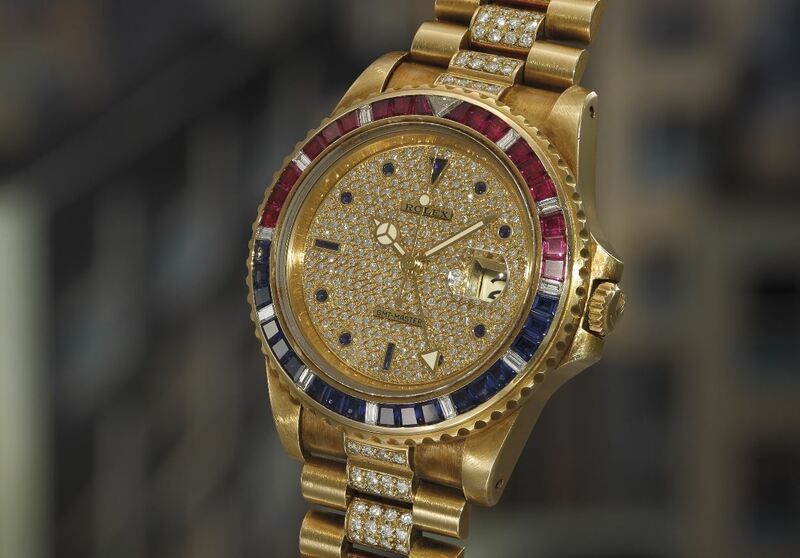 16758 SARU as the first Rolex sports watch embellished with precious stones. Hailing from 1986, the combination of blue sapphires and red rubies on the bezel mimics the colors of the famous “Pepsi” bezel of the inaugural GMT-Master from the 1950s. There’s also the diamond pave dial with sapphire indices and a President bracelet also set with diamonds. The Rolex ref. 16758 SARU’s lavishness is accompanied by the GMT-Master’s famous practically with its dual time zone function. 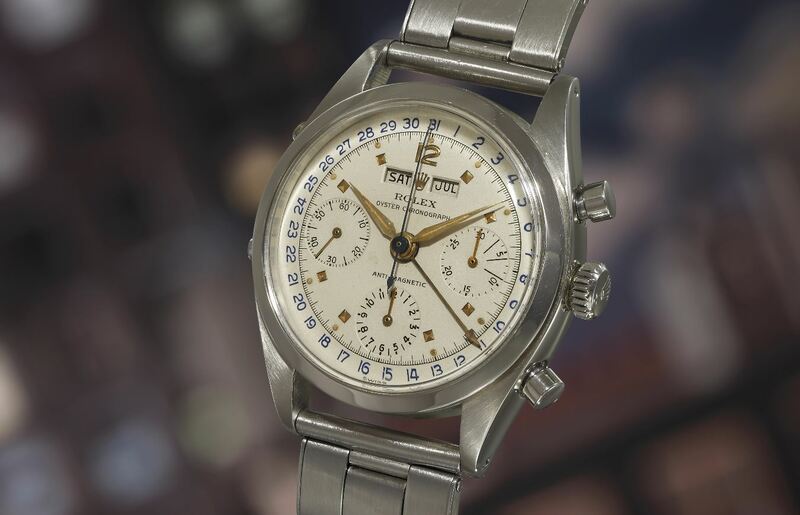 Deep pockets are required to bid on this gem GMT-Master, estimated to sell anywhere from $180,000 to $360,000. As 2017 marks the 60th anniversary of the Rolex Sea-Dweller, it’s great to see a very early example of the inaugural reference, the Sea-Dweller ref. 1665, coming up for auction. In addition to the characteristic two lines of red text on the MK1 dial, this particular Double Red Sea-Dweller ref. 1665 from 1968 also includes the sought-after “Patent Pending Rolex Oyster Gas Escape Valve” inscription on the caseback. That marking is in reference to the helium escape valve (HEV), a Rolex invention that made its debut on the Sea-Dweller dive watch. The pre-sale estimate of this lot is $80,000 – $160,000. 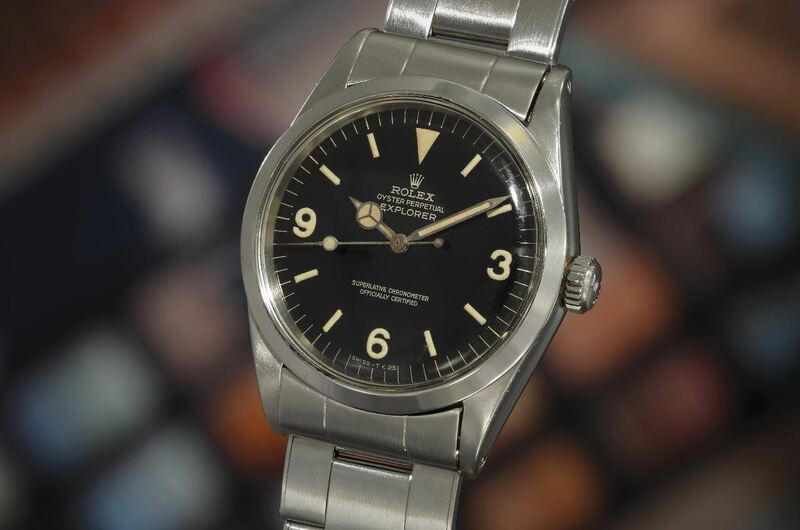 While not as bold or expensive as other Rolex watches on the list, the Explorer ref. 1016 is nonetheless very much an icon. And this particular example of the Explorer ref. 1016 checks off all the boxes with its black lacquer dial, gilt print, and patina luminescent indexes including the signature 3, 6, and 9 numerals. Sporting the customary 36mm Oyster case, this Explorer comes with a modest price estimate of $8,000 – $16,000. If you can’t make it out to New York City this October 26 to witness what will perhaps be the most important watch auction in recent history, don’t worry, I’ll be there live on Instagram to bring you all the excitement. Follow us on Instagram @bobswatches to witness our live feed and the exciting events.